Platforms: Educanon is a web based site that can be accessed by all platforms, but is also available as a chrome extension. Cost: There is no cost for using the site, all that must be done to access it is to create an account. Summary: Educanon is a web based site, that gives you quizzes in the form of videos. To use the site you can either create an account or sign in with your Google account if you have one. Once you are in logged into Educanon it will bring you to the home screen where you can add classes, based on the username set by your teacher. Once the class or classes are added, all that you have to do is click on the class. Once in the classes page there will be circles that you can click on to access the quiz/lesson that your teacher wants you to do. In the top right corner of the page there is a star with the amount of lessons that you have completed, and at the bottom it will tell you how many are due and any up coming events. 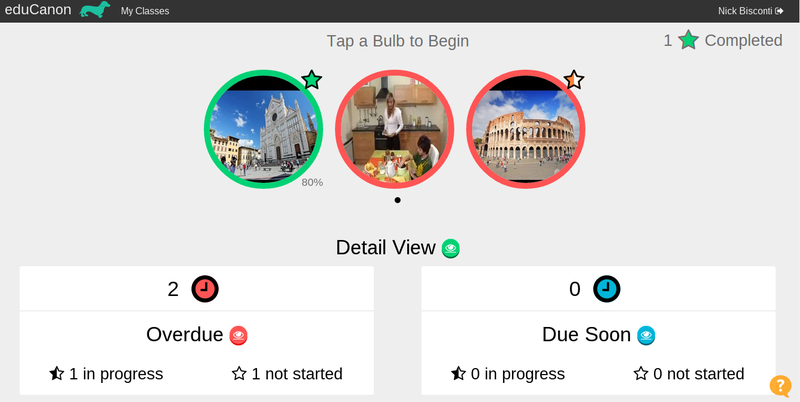 Along with these features next to the lesson there will be a grade, that tells you how well you did on your lesson. Lastly, to sign out of your account simply hover over your name and the sign out button will appear. Exemplar: In my Italian class we are currently using the site, to take online quizzes, and to study the history of Italy. Classroom Uses: This site makes classroom learning easier, because teachers can make lessons on this site and can also give students quizzes on the chapters they are learning or the lessons. Workflow: With Educanon the teacher has total control over her/his page, and can see what students are doing on the page. Students would not have to submit their grades or lessons to the teachers, because once they finish, it is automatically sent to the teacher. This makes collecting lessons and tests/quizzes easy. Collaboration: This app is easily accessible and user friendly for all students, and students do not need permission to access there lessons which allows for quick access for all of their classes. Saving/Draft: Once the student completes the lesson the lesson is automatically saved, and if the lesson is exited without finishing it will replay from where you left off when you start it back up again. As for editing your answers, once you submit a answer, that answer is final and cannot be changed. As a result, answers must be chosen carefully.